The present research, an integrative study combining archeology, skeletal biology, and molecular anthropology, deals with skeletal remains recovered in Mora Cavorso Cave (Jenne, Rome, Italy). Burial activity there dates to 6275 ± 45 BP (5322–5084 cal.) and 6405 ± 35 BP (5472–5314 cal. ), according to 14C analyses of a charcoal fragment and a human bone, respectively. This range of dates ascribes the human remains and the archeological materials to a late phase of the Early Neolithic of Central Italy. The human skeletal remains were scattered throughout the cave. We performed morphological examinations and carbon and nitrogen isotope analyses—using bone collagen—to reconstruct the paleobiology and the paleodiet of the community. The complex comprised at least 28 individuals, including adult males and females and sub-adults. The skeletal remains exhibited a high degree of biomechanical stress and several cases of degenerative and infectious diseases; one of them showed a sclerosing mastoiditis. The stable isotope analyses suggested a diet rich in terrestrial food sources in particular sheep and goat livestock. These results seem to point out that no dietary shift occurred during the Neolithic period in this community, suggesting the maximum use of the environmental resources that these early Neolithic had available. It is worth noting that two individuals showed high nitrogen values, likely the result of nutritional stress brought on by limited protein intake or metabolic diseases. Gabriele Scorrano and Marica Baldoni contributed equally to this work. The online version of this article ( https://doi.org/10.1007/s12520-018-0615-9) contains supplementary material, which is available to authorized users. 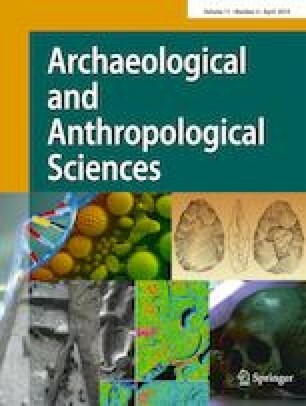 The authors are grateful to Dr. M. Angle and Dr. A. Zarattini (Soprintendenza per i Beni Archeologici del Lazio, Italy) for providing access to the skeletal remains from Mora Cavorso studied in this research. The authors thank Shaka Zulu Speleo Club Subiaco for the discovery of the Mora Cavorso Cave, R. Ciaffi and D. Passacantando for beginning the morphological study and removing the calcareous concretions for further analysis, Dr. G. Manenti and S. Greco for performing the CAT scan at Policlinico Tor Vergata, D. Leonardi for the scanning electron microscope (SEM) evaluation, Prof. G. Arcudi for his kind support during the anthropological examination, and Kenneth Britsch, Lindsey Anderson and Andrew Bolduc for their assistance with the English revision of the manuscript. Finally, we wish to thank the reviewers and editor for their constructive comments and suggestions. C.M-L and O.R. designed the research; O.R. provided financial support, G.S, M.B., and C.M-L performed the analyses provided in the study; M.F.R. directed the excavation campaign; M.BR. performed the isotope analysis by mass spectrometry; G.F. collaborated in the paleopathological study; G.S., M.B., M.F.R., C.M-L, and O.R. wrote the paper, all the authors edited the manuscript for intellectual content, revised and provided critical comments on the manuscript. This work was supported by MIUR-PRIN: grants prot. 2008B4J2HS and 2010EL8TXP allotted to Olga Rickards. MIUR-PRIN numbers prot. 2008B4J2HS and 2010EL8TXP allotted to Olga Rickards.